A new article by Julian Fulton, Heather Cooley, and Peter Gleick evaluates California’s water footprint, finding that California’s water footprint demonstrate a set of vulnerabilities and policy options that do not emerge in national-level assessments. The article, published in Water Resources Management, demonstrates that water footprint assessments may find greater policy relevance when scaled to analytical units where water-related decision making occurs. Abstract: Methods and datasets necessary for evaluating water footprints have advanced in recent years, yet integration of water footprint information into policy has lagged. One reason for this, we propose, is that most studies have focused on national units of analysis, overlooking scales that may be more relevant to existing water management institutions. 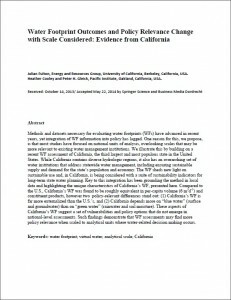 The authors of Water Footprint Outcomes and Policy Relevance Change with Scale Considered: Evidence from California illustrate this by building on a recent water footprint assessment of California, the third largest and most populous state in the United States. While California contains diverse hydrologic regions, it also has an overarching set of water institutions that address statewide water management, including ensuring sustainable supply and demand for the state’s population and economy. The water footprint sheds new light on sustainable use and, in California, is being considered with a suite of sustainability indicators for long-term state water planning. Key to this integration has been grounding the method in local data and highlighting the unique characteristics of California’s water footprint, presented here. Compared to the U.S., California’s water footprint was found to be roughly equivalent in per-capita volume (6 m3d-1) and constituent products, however two policy-relevant differences stand out: (1) California’s water footprint is far more externalized than the U.S.’s, and (2) California depends more on “blue water” (surface and groundwater) than on “green water” (rainwater and soil moisture). These aspects of California’s water footprint suggest a set of vulnerabilities and policy options that do not emerge in national-level assessments. Such findings demonstrate that water footprint assessments may find more policy relevance when scaled to analytical units where water-related decision making occurs.